Regular GHE readers will know that I love everything green and white, but what spurred the eventing world’s best riders to choose their signature colour schemes? 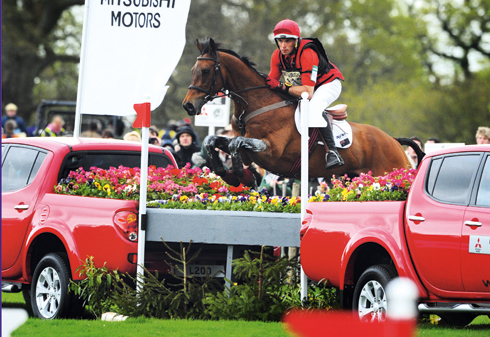 I talk to Badminton 2010 Champion Paul Tapner about his trade mark red, eventing likes, dislikes, and hypothetical horse swapping. So Paul when did your colour coordination begin? Was it planned or accidental? It was vaguely accidental because originally I wanted my colours to be dark blue and light blue, but in Pony Club in Australia I represented my zone many times, and my zone colours were red and white. Because as a young kid representing my zone, we were young, patriotic, typical sporting kids we made sure every single bit of kit we had to go and represent our zone at the state champs was red and white, so our horses and ourselves were decked head to toe in red and white stuff. Then when I went eventing once and forgot my blue kit, I had huge amounts of spare red kit, so I rode in that and it just sort of stuck. And how far does your colour coordination extend? Might we see you sporting some red bling in the dressage arena next? My dog digger who himself is quite well known on the eventing circuit did have a red diamanté collar at one stage, but if you know my boisterous dog you’ll know that that collar didn’t last very long! I think I’ll stay away from the red bling, although I do have a red saddle now don’t I? to go with the red boots on my horses, so the next thing I guess is a bit of red trim on my own riding boots. The last time I remember celebrating a win was on the way home from Pontispool where I spent the grand total of 69p on myself downloading a song, I’m a crazy guy! How would you rank all 3 phases of eventing from most to least favourite? It’s gotta be cross country as my most favourite, then dressage, then show jumping. Although at this stage in my life I wish I’d become a show jumper because at least they can earn a living off the prize money! Hypothetically if you could ride any horse for each stage of an event who would you pick? I think I would like to ride Supreme Rock in the dressage, and then I would like to get onto either Over To You or Darien Powers for the cross country and ummmm….. Milton in the show jumping! Combine all of those horses into one little event horse. Ahh I should have said Tortilas in the dressage that would have probably been better, but we won’t go to that extreme, also I should really pick an event horse for the show jumping, something that’s careful…… Borough Pennyz. Which aspect of your job do you enjoy the most? Winning! So that I can treat myself and download a 69p song! Woo hoo! Which aspect of your job do you dislike the most? Beer! I wouldn’t have either of those, so If beer’s not an option I won’t have anything. That gives you a little more insight into what I actually do to celebrate a win! What up and coming young eventing talent (horse and/or rider) do you rate? There’s a horse in Australian under Shane Rose called Virgil he is amazing and so is Shane so that horse is destined for great things, and in terms of riders the obvious one is Emily King she’s got everything about her like her mother plus a bit more I think. What words of wisdom do you find help you? What useful piece of kit could you not do without and that saves you time? A Market Harborough, that’s for use at home obviously! Uuummmm …..’go hard, or go home’ yeah, there you go! If you weren’t an eventer what would you be? Well do you want me to list all the things I have been along the way? That’s probably what I’d end up doing. I’ve been a professional fencing contractor, I’ve run a portable stabling business, and I’ve been a professional truck driver. What I actually wanted to do was be a farmer, or a forensic scientist so there you go, there’s some insight into how much I jump around! Fairfax Girths: Not just another gadget!